c:geo for Blackberry is no longer updated. If you have BB10.2.1, pease use the official Android version (sideloading). c:geo is now also available for BlackBerry BB10. Get it for free at appworld.blackberry.com/webstore/content/28277410. See below if you still are stuck on BB10.0. 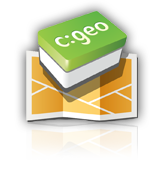 c:geo is a simple to use but powerful geocaching client with a lot of additional features. In contrast with other similar applications, c:geo doesn’t require web browser nor exports. You can just go geocaching with your phone and without any home preparation or worries. Of course, you can go without paying – it’s free. c:geo is developed by the c:geo team. I only maintain only the BlackBerry version! For help, you can ask me or directly the c:geo team at www.cgeo.org if it is not a BlackBerry specific problem. Get it for free at appworld.blackberry.com/webstore/content/28277410. If you are still stuck on BB10.0, you download it from here and side load it (see my sideloading post). As far as I could test, everything except the file selectors in the settings will work. Please sideload the official Android version as available from https://play.google.com/store/apps/details?id=cgeo.geocaching. I am currently not a Premium member, so I cant test it myself. How ever as a basic member it still works fine. Maybe you need to update to the latest version. Have you got a link for c:geo on Blackberry Curve please? I can’t seem to find one. Groundspeak changed their website so c:geo has to be updated. I am currently testing the latest version which is working fine. Sadly it will again be a lot of work to fulfil Blackberries requirements, therefore it will take a while until it will be available in the store.